Why should you buy eTauro’s knockoff Surface Pro 3 docking station? Two reasons: price and physical flexibility. If you don’t mind connecting via Wi-Fi, that is. At this point, it’s fair to say that we’re fans of Microsoft’s Surface Pro 3, a premium Windows tablet with very few flaws. But its minimum $799 sticker price may turn off some, and Microsoft’s Surface Pro 3 Docking Station tacks on an additional $199. At about $70 (plus the price of a separate charger), eTauro’s compatible dock (which it also refers to as a “DUC” on its Web site) is a fraction of what you’d pay to Microsoft, but it offers a subset of what Microsoft’s dock does, too. The eTauro dock fits snugly, and allows the tablet to recline as you wish. The entire point of a docking station is to add back the expansion capabilities that a tablet simply doesn’t have room for. 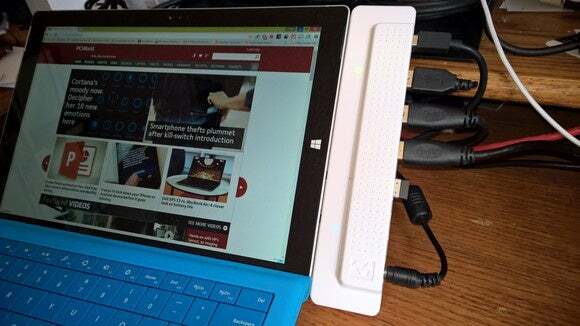 Microsoft’s Surface Pro 3 tablet offers just one USB 3.0 connector and a miniDisplayPort connector for expansion, together with a charging port that also offers I/O connectivity. 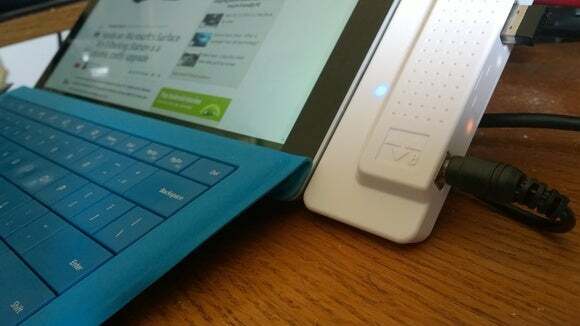 Microsoft’s SP3 dock grasps the tablet on both sides, plugging into the SP3’s charging port. 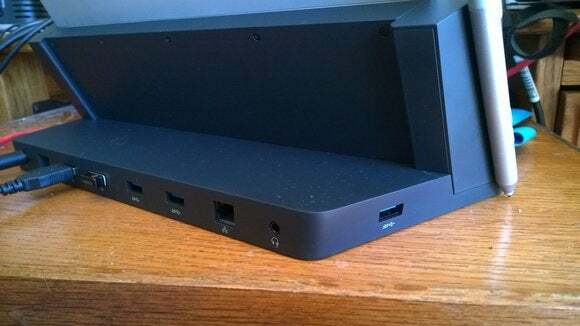 On the rear of the dock are three USB 3.0 ports and two USB 2.0 ports, plus a second miniDisplayPort connector and ethernet jack. Incidentally, that leaves the tablet’s miniDisplayPort and USB 3.0 connector free and available for you to use. Like the Surface Pro 3, Microsoft’s docking station is a rather elegant piece of hardware engineering. But it has two flaws: first, it reclines the tablet at a fixed angle. And second, it places the expansion slots quite far away. Microsoft’s own Surface Pro 3 docking station is well built and provides a number of USB ports, but holds the tablet at a fixed angle. eTauro’s dock isn’t really a dock at all; instead, it’s a rather ungainly piece of white plastic that plugs into all three connectors on the side of the tablet. 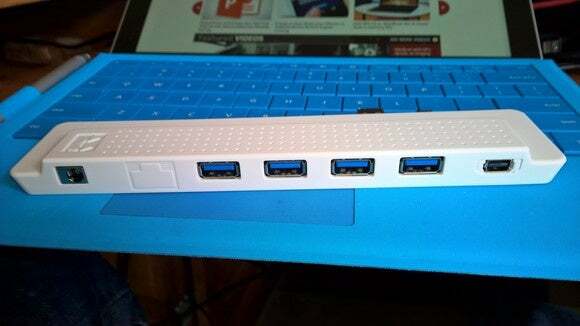 It offers only four ports, though they’re all USB 3.0. It also includes a miniDisplayPort connector. What eTauro’s dock does do, however, is allow you to recline the Surface Pro 3 at any angle that the tablet’s kickstand allows. That’s rather useful. Personally, I keep the SP3 and its dock tucked inside my keyboard drawer, using an external monitor above it. For me, Microsoft’s dock orients the tablet just a bit too vertically to be comfortable. The downside, of course, is that you lose access to one miniDisplayPort and two USB ports, compared to what Microsoft’s dock allows. And if you like your desk nice and tidy, then a bunch of cables snaking out the side of your tablet might not be your cup of tea. This look might not be for everyone. But the major drawback is that eTauro’s dock lacks an ethernet jack—although the plastic chassis includes an area that appears to be designed for it. While it's likely most users will connect the Surface Pro 3 via Wi-Fi, the absence of ethernet may be a deal-breaker for some. There’s another wrinkle of note: eTauro’s solution inexplicably lacks the12V/5A 2.1mm charger it requires, so you’ll have to purchase your own for $15 on Amazon or elsewhere. Our review unit did come with a car charger, though, so there’s that. The SP3’s kickstand seems to handle the eTauro’s 3-ounce weight without batting an eye. And there’s no question that the physical flexibility to adjust the viewing angle as you see fit is a key selling point. I did notice some occasional issues when connecting to an external monitor, however, and eTauro’s dock can get a bit touchy if you’re maneuvering your tablet back and forth. Nevertheless, as long as you’re aware of the eTauro’s limitations, I have no problem recommending it as an somewhat ungainly but practical upgrade to the Surface Pro 3.
eTauro's Surface Pro 3 docking station isn't much to look at, but it restores physical flexibility to your desk that Microsoft's own dock currently can't match, and for quite a lot less.